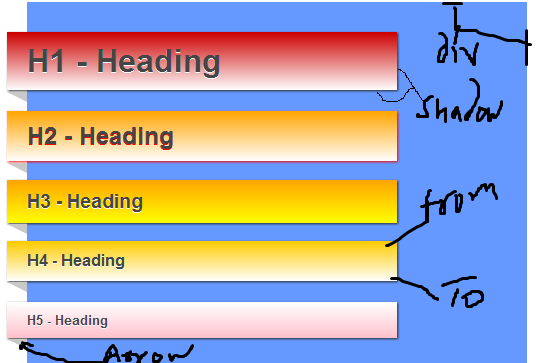 Many designers resist using header tags (H1, H2, etc.) on their Web pages because the spacing around the tags can break a tight page layout. I have used header tags and applied some css effects, it easy to write with 10-12 line of css and html Output will look like image shown. First we need to add a div tag to our html page to put header on it. Arrow class for dropping shadow. Now just create a html Page and put a header and you have done assuming that you have written css in separate file named jstyle.css. Note: This will not work on browsers which does not support CSS3.